On the 4th floor of Diamond Plaza mall, amidst many small food joints and a food court, there is one newly (almost 1 year old) opened restaurant, who wants to serve Kolkata people their second most favorite Indian food, Punjabi food, more specifically dhaba food. Therefore, they call themselves Rang De Basanti Dhaba. Though in close room, they kept a real-size tractor inside the restaurant to bring the "Dhaba Feel". 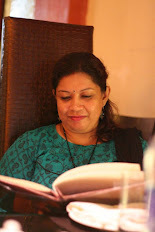 I was there representing my foodie group, Kolkata Food Bloggers, on invitation from them to taste and review their newly launched Menu. They serve very authentic Punjabi food from different regions of Punjab, which most of us never heard about and want to include more new dishes time to time. I was totally overjoyed when I got this invitation, because I love Dhaba food, so there was no chance I could avoid this invitation and another plus point was, this place is quite close to my home. 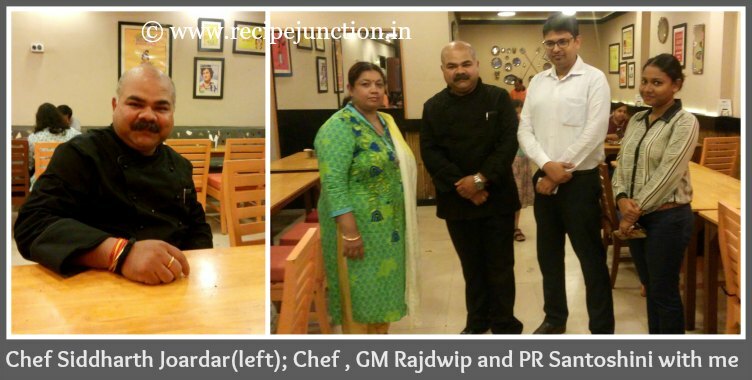 with loads of excitement when I reached there, I was heartily greeted by PR Santoshini and GM Rajdwip, they offered me a seat and while I was just checking the interior, welcome drink was served. Takdewali Chanch, which is plain buttermilk seasoned with roasted spices, chilli flakes, coriander etc. The drink was an immediate thirst-quencher on a hot and humid day. I had a nice chat with GM, who was a great host and eagerly telling me about their Restaurant. Diamond Plaza Mall outlet is their second outlet after Salt Lake Sector 5 Outlet and they are soon going to open another outlet in Kolkata. 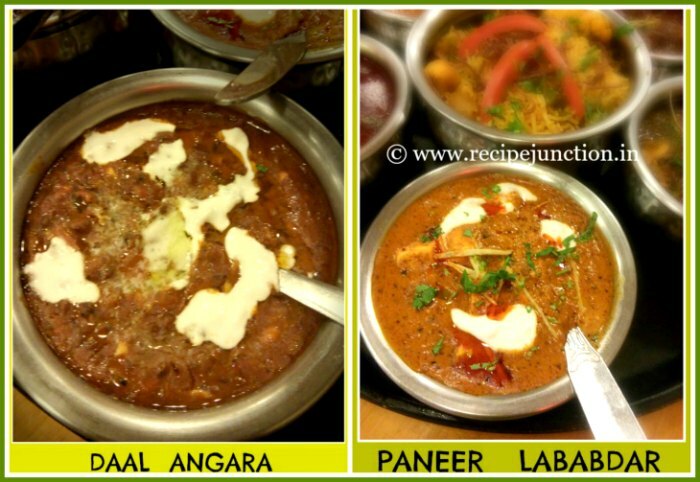 Their motto is to serve authentic Punjabi food to Kolkata people because nowadays what I get in the name of Punjabi food is just plain North Indian food, authentic Punjabi food is far more interesting and different and is available in hundreds of varieties. According to him, they are going to bring authentic punjabi dishes from all regions of Punjab for Kolkata People. 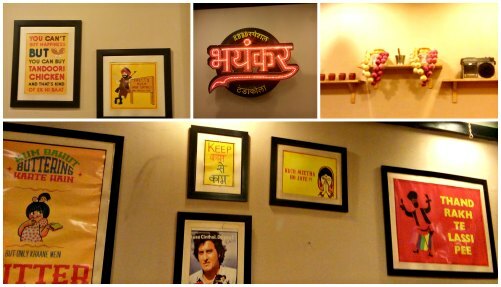 Their menu is full of kebabs, tikkas and tandoori dishes along with some North Indian fares. Menu card is full of options for both vegetarians and non-vegetarians in every category. When it comes to food, there must be a big mention of the Chef of RDBD, Chef Siddharth Joardar, who was graciously taking care of us, all the bloggers invited for the event and making sure that we are feasted well even though the restaurant was full of visitors that time, He joined us and chatted with us about his so long food journey and about his plans for RDBD. He was a great host and I must admit a great cook too. He has joined RDBD just around six months ago, after serving his career in many five-star hotels outside Kolkata. As he is new to Kolkata food market, he wants to explore Kolkata Food market more and wants to bring authentic Punjabi delicacies with local twist to RDBD. Each and every dish we were served was extraordinary, with full of flavours and not so very rich unlike other restaurants serves North Indian fares. Cutleries : Another instant love for RDBD was the cutleries for me. Decor : When it comes to full-service restaurant, inside decor is very important to many visitors. Here in RDBD, they tried to bring the "dhaba feel" in desi style off course, using traditional milkcans as hanging lamps, huge center cendeliar using spoons and forks and funny Punjabi quotes framed as a wall-decor. And a life-size tractor welcoming you inside the dhaba, will give everyone a desi dhaba feel for sure, not much over-the-top decoration makes the place look bigger and brighter. There are about 45-50 seat arrangements in this outlet and it is always full with visitors. After the welcome drink, two starters were served immediately. One Veg and One Non-Veg. In Veg., they served Moong Dal Ki Phillori, which was small round shaped ball made with yellow moong dal along with some aromatic spices well-blended and deep-fried to perfection. These were something I never had before and just loved them with mint chutney and salad by the side. A must-have in RDBD. 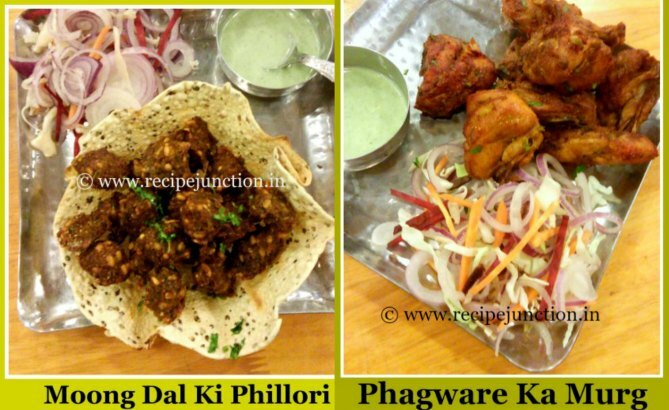 In Non-veg., there was Phagware ka Murg, small bite-size chicken pieces with bones, seasoned with again loads of assorted spices and deep fried to crisp yet tender Chicken pieces. It was absolutely finger-licking good with again mint chutney and salads by the side. A must-have in RDBD. To accompany the main course dishes, RDBD served a Veg Masala Pulao, which is their new addition and 3 sorts of rotis. The Pulao was just lovely loaded with vegetables, very simple but aromatic pulao, it was just marrying each dish like match made in heaven. And in rotis, they served Tandoori roti, Lachchha Paratha and Naan. And we all know punjabi dishes always go well with tandoori rotis. Chef Sidhharth Joardar is absolutely opposed to serve Biriryani with Punjabi dishes. According to him, Punjabi dishes don't go well with biriyanis and I totally agree with him. In the main course, they are adding Daal Angara. Chef and GM Rajdwip both were recommending to try this daal first and I did. As the name suggests, this dish is quite spicy but blended so well with flavours that you won't realize its spiciness instead you'll crave for more and more of this creamy daal, made with Black Urad dal. We all were licking the daal off our plates, this was so finger-licking delicious. A must-have in RDBD. Another veg dish they are adding is Paneer Lababdar, paneer pieces dunked in a creamy gravy dish loaded with flavours typical to Punjab cuisine. It was going great with both Veg Pulao and rotis. Next was Railway Mutton Curry, at first it looked really spicy and oily, with lots of red oil floating over the mutton pieces. Chef Joardar understood our concern and showed us that those oil was just seperated from the spices and it was not an excess oil from the curry. It was really flavourful, not at all spicy or oily, very simple but aromatic mutton curry. Really recommended to try out when visited. In Chicken, their new addition is Methi Chicken, an absolute favorite Punjabi dish of mine but it is quite difficult to bring the perfection in this dish. But I totally loved Methi Chicken here in RDBD, creamy fenugreek leaves nicely coating succulent chicken pieces in a fenugreek flavoured curry. In one word, awesome it was with rotis. A must-have in RDBD. 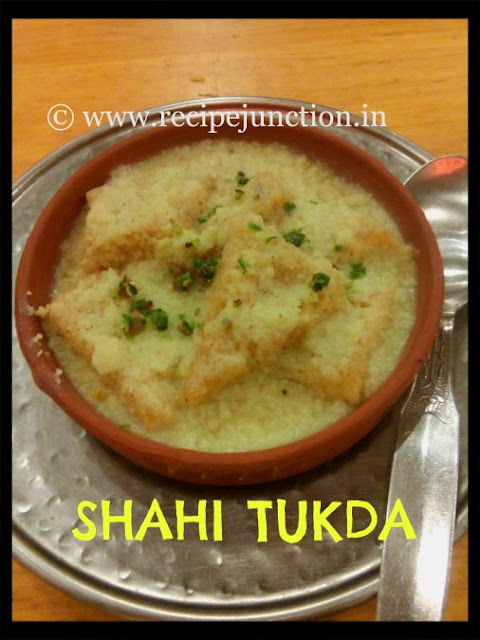 After all these yumminess, when we were all full till our throat, there came the new dessert in the menu, Shahi Tukda. I just thought I would skip this dessert as I know it is quite heavy and loaded with sweetness. 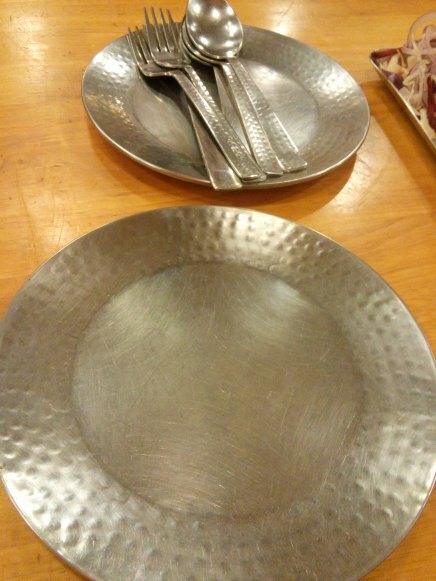 But after Chef pushed to try a bit, we all could not stop ourselves to lick off the whole plate in no time. It was in one word, "divine". The bread slices were still crispy even after soaking in the thickened milk. I never had so tasty and yummy Shahi Tukda in my life. It was just so perfect, though it was quite sweet but it was divine. A must-have in RDBD. Loved the ambiance. Loved the hospitality of everyone serving in that place. Loved the food and mostly, loved the passion of Chef Sidhharth Joardar. The interesting fact about all the dishes I tasted was none of them was over-the-top rich and spicy, was perfectly balanced with flavour and taste. And for me this is a sign of a good Chef and where the chef is so balanced, that place is worthy of paying a visit. 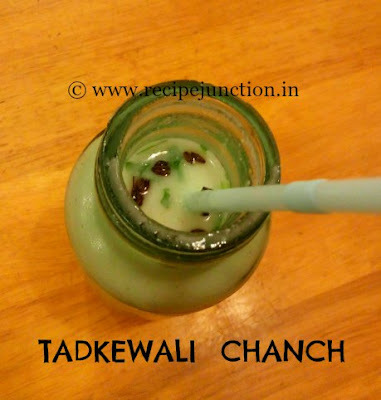 100% recommendation from my side, if you love Dhaba food yet very health conscious, this is the right place for you. 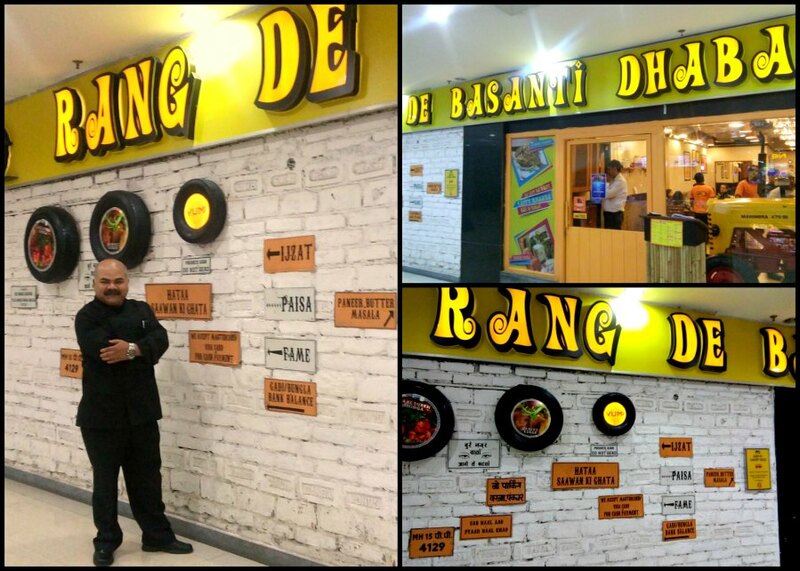 Hope RDBD will keep their passion intact for many more years to come and will serve Kolkata People what they desire to serve, authentic Punjabi food, which is my second most favorite cuisine after Bengali cuisine. Finally, A huge THANK YOU to everyone for inviting me over and for your awesome hospitality. And a special THANKS to Chef for such Yummy food.